An oil platform that burned for 36 hours after a massive explosion sank into the Gulf of Mexico on Thursday, and 11 workers still missing may have been near the blast and unable to escape, officials said. Meanwhile, the submerged well could be creating a major environmental problem, potentially spewing up to 8,000 barrels of crude oil per day, the Coast Guard said. An additional 700,000 gallons of diesel fuel were stored on the now-submerged rig, reports CBS News correspondent Whit Johnson, and officials don't know whether that fuel is also spilling. The Coast Guard said Thursday evening that there had been an initial explosion three hours before the rig went up in flames on Tuesday, but later retracted its statement, saying the error was due to a computer time-stamp problem. Petty Officer Tom Atkeson said there was only one report sent at 10 p.m. CST. Adrian Rose, vice president of rig owner Transocean Ltd., said crew members who survived Tuesday's explosion indicated the missing may have been near the blast and unable to escape. Officials had hoped they might have been able to get to a covered lifeboat with supplies. The rig was doing exploratory drilling about 50 miles off the coast of Louisiana. Rescue crews have covered a 1,940-square-mile search area by air 12 times and by boat five times. The Coast Guard has now expanded its search area to include 3,000 square miles around where the platform was anchored. Before it sank, supply vessels had been shooting water into the rig try to control the flames enough to keep it afloat, but couldn't, Coast Guard Petty Officer Katherine McNamara said. The search for survivors is continuing, though one relative said family members have been told it's unlikely anyone survived. Carolyn Kemp, whose grandson Roy Wyatt Kemp, 27, was among the missing, said family members have been told it's unlikely anyone survived. Roy Kemp would have been on the drilling platform when it exploded. "They're assuming all those men who were on the platform are dead," Carolyn Kemp said. "That's the last we've heard." Other relatives waited anxiously for hourly updates. Other relatives waited anxiously for hourly updates. Tracy Kleppinger, whose husband, Karl, is among the missing workers, said she is hopeful he will be found alive. "For me there is no other option," Kleppinger told CBS' "The Early Show" Thursday. Working in the oil industry is more dangerous than working in coal mines, CBS News correspondent Kelly Cobiella reports. 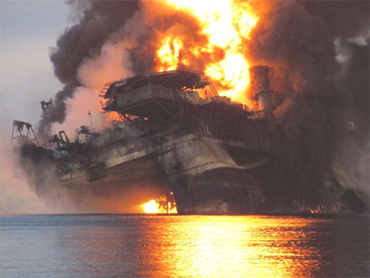 On rigs in the Gulf of Mexico alone there have been 59 fatalities, more than 1,300 injuries and 853 fires since 2001. Family members of one missing worker, Shane Roshto of Amite, Miss., filed a lawsuit in New Orleans on Thursday accusing the rig's owner of negligence. The suit said he was thrown overboard by the explosion and is feared dead, though it did not indicate how family members knew that was what happened. The suit names Transocean Ltd., which owns the rig, and oil giant BP, which contracted it. A Transocean spokesman did not immediately respond to a request for comment and BP wouldn't discuss the suit. Three recent federal inspections turned up no violations at an offshore drilling rig that exploded and sank in the Gulf of Mexico. The Interior Department's Minerals Management Service said it inspected the Deepwater Horizon in February, March and on April 1. Spokeswoman Eileen Angelico says the rig moved to the site about 50 miles southeast of the Louisiana coast in January. It was inspected three times as part of the agency's regular drilling program. The MMS - in cooperation with the Coast Guard - will launch investigation "when the time comes" Deputy Secretary David Hayes said at a Wednesday press conference. The Coast Guard and BP together have at least 35 oil containment vessels dispatched to the area, Johnson reports. They may use an unmanned submersible vehicle to stanch the flow of the oil - the same plan as before the rig collapsed - but could not say when that might be done. The family of Dewey Revette, a 48-year-old from southeast Mississippi, said he was also among the missing. He worked as a driller on the rig and had been with the company for 29 years. "We're all just sitting around waiting for the phone to ring and hoping for good news. And praying about it," said Revette's 23-year-old daughter, Andrea Cochran. Transocean Ltd. spokesman Guy Cantwell said 111 workers who made it off the Deepwater Horizon safely after Tuesday night's blast were ashore Thursday, and four others were still on a boat that operates an underwater robot. Seventeen others hurt in the blast had been brought to shore Wednesday with burns, broken legs and smoke inhalation. Four were critically injured. A slow trek across the water brought most of the uninjured survivors to Port Fourchon, where they were checked by doctors before being brought to a hotel in suburban New Orleans to reunite with their relatives. One worker said he was awakened by alarms and scrambled to get on a life boat. "I've been working offshore 25 years and I've never seen anything like this before," said the man, who like others at the hotel declined to give his name. Stanley Murray of Monterey, La., was reunited with his son, Chad, an electrician aboard the rig who had ended his shift just before the explosion. "If he had been there five minutes later, he would have been burned up," Stanley Murray said. The rig was doing exploratory drilling about 50 miles off the coast of Louisiana. Rose said crews were doing routine work before the explosion and there were no signs of trouble. He said the explosion appeared to be a blowout, in which natural gas or oil forces its way up a well pipe and smashes the equipment. But precisely what went wrong was under investigation. There is a delicate balance of pressure as an oil drill is sunk into ocean rock and water is pumped down into the well to push oil up. If too much pressure builds, the oil can suddenly and forcefully gush back up. An emergency valve known as a "blowout preventer" can seal pipes off, but if it fails or isn't activated, the surge can cause a massive fire. The Deepwater Horizon was one of the largest of the 90 drilling rigs now operating in the Gulf of Mexico. At 396 feet long and 256 feet wide, it's 36 feet longer and nearly 100 feet wider than a football field, Cobiella reported. A column of boiling black smoke rose hundreds of feet over the Gulf of Mexico. Officials said environmental damage appeared minimal so far. Coast Guard Petty Officer Ashley Butler said crews were prepared for the platform to sink. "There is equipment out there to help with the environment and the potential environmental impact," Butler said. A total of 126 workers were aboard. Seventy-nine were Transocean workers, six were BP employees and 41 were contracted. The blast could be one of the nation's deadliest offshore drilling accidents of the past half-century. One of the deadliest was in 1964, when a catamaran-type drilling barge operated by Pan American Petroleum Corp. near Eugene Island, about 80 miles off Louisiana, suffered a blowout and explosion while drilling a well. Twenty-one crew members died. The deadliest offshore drilling explosion was in 1988 about 120 miles off Aberdeen, Scotland, in which 167 men were killed. Rose said the Deepwater Horizon crew had drilled the well to its final depth, more than 18,000 feet, and was cementing the steel casing at the time of the explosion. "They did not have a lot of time to evacuate. This would have happened very rapidly," he said. According to Transocean's website, the rig was built in 2001 in South Korea and is designed to operate in water up to 8,000 feet deep, drill 5½ miles down, and accommodate a crew of 130. It floats on pontoons and is moored to the sea floor by several large anchors. Workers typically spend two weeks on the rig at a time, followed by two weeks off. Offshore oil workers typically earn $40,000 to $60,000 a year - more if they have special skills.